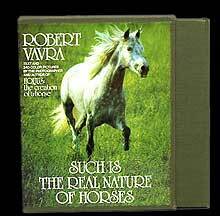 Robert Vavra's masterpiece on equine social behavior. "Each photo is its own bit of poetry...in magical, dreamlike settings that prove that nobody knows the essence of a horse as well as Robert Vavra." "The pictures are superb...breaking new ground in the study of animal behavior."